Experience Floras and Faunas en route. Breathtaking views of Annapurna (south), Himchuli, and Gangapurna mountains. Ghandruk Trek – 3 Days is one of the most popular short treks in Nepal. This trek is famous for the mountain views, Gurung culture and their hospitality. Ghandruk is the village with largest gurung settlements of Annapurna Region. It is also a common en route place for many treks within Annapurna region. Ghandruk village is situated in the northwest part from the city of Lake Pokhara at an altitude of 1940m above the sea level. Ghandruk is the most popular short and scenic trek that can be done from Pokhara. As the maximum altitude of this trek is only 1940 meters there is no chance of getting altitude sickness. Similarly, Ghandruk Trek can also be the best destination for family treks as well. Ghandruk Trek offers you amazing trials with most amazing views and lots of good experiences of lifetime. The warm and unique hospitality of gurung people will increase your affection towards the place. Moreover, you can also try the Gurung attire and take the pictures in traditional style. Ghandruk Trek is also suitable for people of every age group as the trials are relatively simple. You will have a short drive to Nayapul from where the original trek begins. After then the trials follows a steep climb towards Birethanti. From there you can see the spectacular views of mountains framed with rhododendron trees and it looks even amusing with blooming rhododendrons if you are trekking during autumn. After crossing some other villages like Chumurung, Sayuli Bazaar, Kimche and Chane you will find your destination ‘Ghandruk’ with a backdrop of Machhapuchre Mountain next to you waiting to offer you the best experience. One best thing about Ghandruk Trek is that it can be done all year around. It is better to avoid the rainy seasons because you may not have enjoyable trekking experience during rainy season. The best time for Ghandruk can be in between September to May. 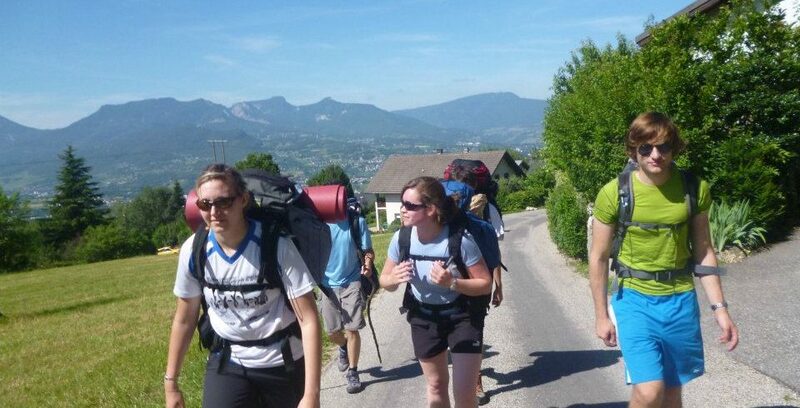 This time of the year gives the best views and the most favorable environment for trekking. Day 01: Drive to Nayapul and trek to Ghandruk. Day 02: Trek to Pothana. Day 03: Trek to Nayapul and Drive to Pokhara. Ghandruk is a town and Village Development Committee in Kaski District in the Gandaki Zone of northern-central Nepal. At the time of the 1991 Nepal census it had a population of 4,748 persons living in 1,013 individual households. Ghandruk, the famous Gurung village at 2,010m (6,600ft), is located northwest of the lakeside city of Pokhara. It is accessible in one day, with a four to five hour walk after a short ride from the city. Given that the small village is on the much used trail to the Annapurna Sanctuary or the Annapurna Base Camp (also called ‘ABC’ by trekkers), it claims to be the most visited trekking area in Nepal, and is widely known and popular among international visitors. After opening the Pokhara-Baglung highway in the mid 1990s, Ghandruk (Ghandrung on some maps) has seen a gradual increase in domestic tourists as well. Drive to Nayapul and trek to Ghandruk. After having breakfast in Pokhara we will start our drive to Nayapul. It takes about 2 hours from Pokhara to reach Nayapul. After then the trial goes through a steep climb and then ascends to the Modi Khola which takes you to Birethanti. The trial passes by forests, terraced fields, rivers and few other small settlements. On your trial you will encounter the rich flora and fauna that this region has been blessed with. The Ghandruk village gives you the picturesque of typical Nepalese lifestyles and gurung cultures. We will have our breakfast at Ghandruk. After then we will start our trek to Pothana. The trek at first goes downhill through uneven stone steps. Going downhill seems easy but can be harder than climbing uphill so you need to be careful. The trials offers breath taking sceneries along the way with is worth the trials. The stairs takes you to Kimbu village on the bank of Modi Khola. The trial again ascends to Landruk village which is also a famous trekking destination. We will stop there for lunch and take a short break. After then we will again begin our trial and pass several villages like Deurali and Tolkha which offers spectacular views of the mountains like Annapurna south, Dhaulagiri, Himchuli and many other and then a short descend will take you to Pothana. Overnight at Pothana. Trek to Phedi and Drive to Pokhara. Today is the final day of our trek. After having breakfast at Pothana we will begin our trial to Phhedi. The trial today is almost a downhill trial. We will pass to several villages on our way. After trekking about 3 hours we will reach to Phedi. From there about 30 minutes drive will take us to the city of lakes Pokhara. ×	Extra fees for the battery charge and hot shower during the trek. Motivation comes in different forms; Shankar Bahadur Gurung found his upon his encounter with a group of foreigners visiting Ghandruk. While many villagers during the 1970s were scared to bump into foreigners, Gurung, despite his inadequacy in English, wanted to talk to them and assist them. The foreigners wanted a place to stay, but there was none - no hotel, no lodge. Gurung, hoping to provide them with any type of shelter, offered them lodging at his house. With everybody gathered around the chulo (hearth), and staying together as a family, a day’s stay turned into three. A small house with one door and no windows must have appealed a lot to the guests, for many other foreigners, upon other villagers’ recommendations, began staying in Gurung’s home. The love he received from the tourists motivated him deeply, motivated him to open Ghandruk’s first hotel – Hotel Milan. Nevertheless, the journey for Gurung wasn’t easy. Financing was the biggest hurdle, but there were so many other factors that Gurung had to deal with. Although basic things like lack of good roads, inadequate supply of materials were obvious difficulties, Gurung also had to deal with the villagers’ backbiting. They were very critical of Gurung’s - what they called “slavish” nature - they despised the fact that he washed dishes, cooked food for the Ghandruk tourists. But Gurung did not back down. He had patience and he did what he had to do. Finally, after a great deal of effort, through loans from banks and his earnings as a teacher, Shanker Bahadur bought a house for himself with Rs. 200,000, that which is equivalent to 50 to 60 lakhs today. The one and only hotel in Ghandruk was thus born, and guests kept pouring in. His hard work paid off and his vision bloomed. Not only did the villagers start respecting him but other people too got inspired to follow his footsteps. His effort to introduce a hotel in Ghandruk paved the way for lodges like Himalayan and Hill Top. In time, as the competition grew, Gurung had to shift his hotel towards the upper part of Ghandruk for better picturesque views, in order to attract more tourists. But what Gurung feels now is a challenge is the load shedding hours, making it very difficult for the hotel as well as his customers. Though he had to make minor changes in his interiors, his guests tell him not to make any changes with his traditional outer designs. Shankar Bahadur is content today with what he has achieved, despite his ups and downs he stays firm and wants to continue serving his guests for as long as he can. Alright, we couldn’t present a list of traditional Nepali dishes without giving dal bhat an entry of its own! 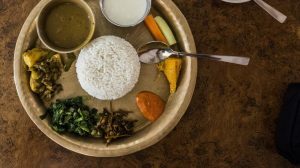 To call this rice and lentil dish a staple of Nepali cuisine would be an understatement – it’s so much more than just rice and lentils. When served in a restaurant or at home, the rice and lentil curry is accompanied by a variety of seasonable vegetable and meat curries (spinach, potato, mushroom, chicken, buffalo, etc), as well as a salad, pickles, papad and curd. It’s not just a dish, it’s a full meal and a tasty and satisfying one at that. It’s no wonder Nepalis are obsessed. Weather-wise, Ghandruk boasts a pleasant climate without extremes of heat or cold, year round. Excluding the monsoon period (July through early Sept), all months are suitable for hikes to Ghandruk, though you might encounter a temporary dusting of snow on some mid-winter days. The village has electricity (generated locally), telephone and a health post. For a comfortable stay, the lodges and inns provide all modern amenities. Some even have Internet access! For a gourmet trekker, they dish out all kinds of great food, from dal-bhat to European and Chinese cuisine. The evenings in the hub area resound to singing and traditional dancing that are arranged by the lodge-owners for their foreign guests. Should you decide to extend your hike, they can arrange trips to Ghorepani and Pun Hill, a day’s walk away, or a more arduous ascent, with necessary logistics, lasting several days into the Annapurna Sanctuary, and to the Machhapuchhre and Annapurna Base Camps. For a short and undemanding hike, a visit to Ghandruk, set in the gentle folds of the midland mountains, in the shadow of formidable Annapurna peaks, high above the Modi river valley, in a rolling hilly countryside, provides amazing glimpses of rural life. It is (at least) a 300-year-old village in its old form, providing glimpses of time-honored ancient cultural traditions. Here, as guests of the legendary Gurungs, you’ll find a fascinating getaway, both memorable and educational.